HELP Jamaica! (HJ) is a registered non-profit organization founded in 2008 in Germany and 2009 in Jamaica. The primary goal is to raise funds in order to support and establish library and education projects in deprived Jamaican communities with the aim of providing free access to education, books and computers, homework assistance and various other activities, especially for children and youths who otherwise don’t have access to these facilities. 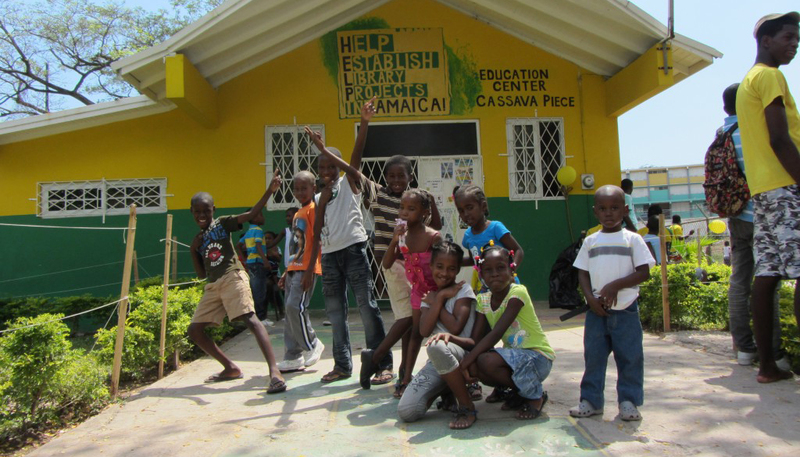 In February 2011 opened the first HELP Jamaica! Education Center in Cassava Piece, Kingston 8. The Center is open from Monday – Friday from 9am – 8pm and enjoys great support with an average daily attendance of 50-100 children and 20-60 adults. The library offers access to a broad collection of books and is equipped with computers and wireless internet access for reference services and research. HELP Jamaica’s! services are offered free of charge for the citizens of Cassava Piece and the surrounding communities. Their programs aim to strengthen and inspire individuals and thus improve, uplift and unite the community. HJ have appointed a professional and caring staff including some young people from the community. We offer a wide range of educational and creative courses and services ranging from a professional Homework Assistance Center, Art and Craft, Drama, Music, Football, Reading and Debating up to professional classes in Mathematics, English, Spanish and Social Studies classes, helping young people and adults to improve their skills and to prepare them for the important tests on the Caribbean Examination Council (CXC) level. The programs are designed to enhance the self-esteem of young people, to support children and youths in their personal development, to help them discover and develop various talents and practical skills. HJ aim to inspire children to learn and practice tolerance in social relationships and to develop interpersonal and social skills, a caring attitude and responsibility. By involving the community and the university as well as working together with other organizations and groups, we foster civil engagement, partnership, participation and voluntary contributions. For 2016 and beyond our focus is on spreading free educational programs into more & more communities island wide. In light of the extremely positive impact our center in Cassava Piece has had on the community, we see this as a blueprint and are now looking for sponsors and partners to offer the same opportunities to other deprived communities. Help us to build a better Jamaica – together we can make a difference!